Yuankai Huo, Zhoubing Xu, Shunxing Bao, Camilo Bermudez, Hyeonsoo Moon, Prasanna Parvathaneni, Tamara K. Moyo et al. “Splenomegaly Segmentation on Multi-modal MRI using Deep Convolutional Networks.” IEEE transactions on medical imaging (2018). The findings of splenomegaly, abnormal enlargement of the spleen, is a non-invasive clinical biomarker for liver and spleen disease. Automated segmentation methods are essential to efficiently quantify splenomegaly from clinically acquired abdominal magnetic resonance imaging (MRI) scans. However, the task is challenging due to (1) large anatomical and spatial variations of splenomegaly, (2) large inter- and intra-scan intensity variations on multi-modal MRI, and (3) limited numbers of labeled splenomegaly scans. In this paper, we propose the Splenomegaly Segmentation Network (SS-Net) to introduce the deep convolutional neural network (DCNN) approaches in multi-modal MRI splenomegaly segmentation. 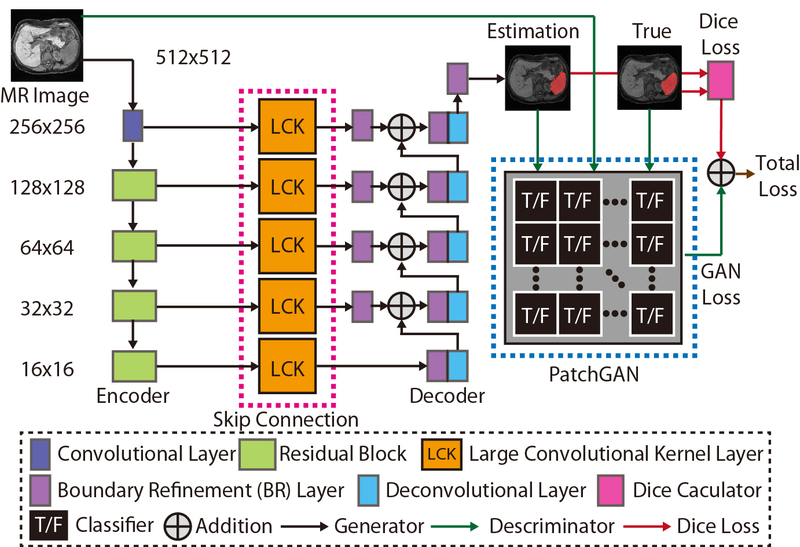 Large convolutional kernel layers were used to address the spatial and anatomical variations, while the conditional generative adversarial networks (GAN) were employed to leverage the segmentation performance of SS-Net in an end-to-end manner. A clinically acquired cohort containing both T1-weighted (T1w) and T2-weighted (T2w) MRI splenomegaly scans was used to train and evaluate the performance of multi-atlas segmentation (MAS), 2D DCNN networks, and a 3D DCNN network. From the experimental results, the DCNN methods achieved superior performance to the state-of-the-art MAS method. The proposed SS-Net method achieved the highest median and mean Dice scores among investigated baseline DCNN methods. This figure presented the network structure of the proposed SS-Net. From left to right, the network consisted of (1) Encoder, (2) Skip-connector, (3) Decoder,and (4) PatchGAN discriminator. The name of each network component was showed in the dashed legend box. Briefly, the ResNet50 was used as encoder. Thelarge convolutional kernels (LCK) with kernel size 7×7 were used as skip-connector. The boundary refinement layers and upsampling layers were employed as decoder. Using true intensity images, true segmentation images, and fake segmentation images, the PatchGAN functioned as the discriminator to supervise the training procedure. Finally, the Dice loss and the GAN loss were combined to derive the final training loss for the proposed SS-Net. .